Looking for a pasta with a cheese sauce but do not want it smothered in cheese. Then this is the perfect plate for you. There is no way for me to say this is a light dish, but it certainly comes off light if you’re used to cheese sauces that typically smother the pasta. The trick here is to mix your cheese sauce with a reduced chicken stock just enough so that the cheese sauce clings to the pasta without making the bottom of your plate soupy. First add 1 tbl of olive oil to your pot of water and bring to a boil. In a saute pan add the rest of your oil, garlic, and onion and cook until onions start to turn translucent. Add the chicken and basil and continue cooking. As the pan begins to dry out put your chicken stock into the pan and reduce in half. When reduced add the cheese sauce and bring to a boil, then simmer for 5 minutes. Drain your pasta and then pour contents of saute pan over the pasta and toss. Plate and sprinkle a little grated parmesean over the top and dig in! 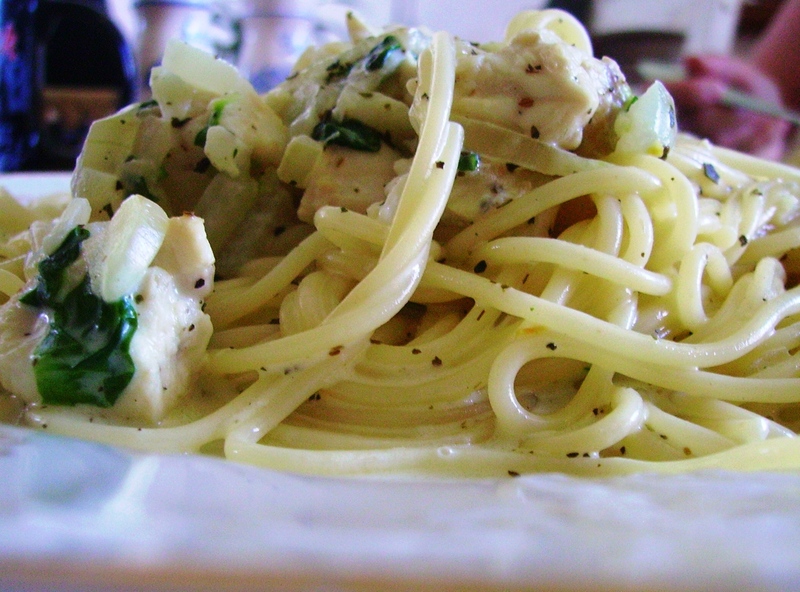 This entry was posted in Baby Spinach, Basil, Cheese, Chicken, Chicken Stock, Cooking, Cuisine, Dinner, Eating, Ementhaler Cheese, Extra Virgin Olive Oil, Food, Garlic, Gorgonzola, Herbs & Spices, Italian, Meat, Olive Oil, Onions, Parmesean, Pasta, Pecorino Romano, Recipes, Sauces & Marinades, Spaghetti, Stock, Vegetables. Bookmark the permalink. Looks delicious.Thanks for the recipe you have shared with us.